From left to right: Paul McCarthy, AASA executive vice president and MEMA senior vice president, strategy, planning and information services; Joe Pase, IT executive director, Tenneco; Scott Thompson, senior vice president, automotive and business services, Epicor; and Fletcher Lord III, PWI vice president. 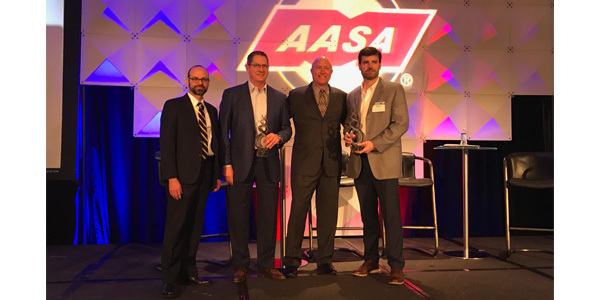 Tenneco and Parts Warehouse Inc. (PWI) are the recipients of the inaugural Automotive Aftermarket Suppliers Association (AASA) Channel Excellence Award presented by Epicor. After narrowing down the entries to three finalists, a selection committee chose Tenneco and PWI for their shared data-analytics program, which focuses on inventory and sales optimization of Monroe ride-control components. Joe Pase, IT executive director, Tenneco, and Fletcher Lord III, PWI vice president, accepted the award at the AASA Vision Conference. The Tenneco/PWI initiative began in April 2018, when Tenneco analysts noted that PWI’s strut-assembly sales were under-indexing against market demand in its service areas. Tenneco sales representatives and members of its data-analytics team met with PWI leaders to propose a collaborative inventory analysis and repositioning to grow PWI’s share of the strut-assembly category, reduce lost sales and improve margin performance. The project involved extensive use of shared data analytics and was completed in August 2018. The other award finalists were Brake Parts Inc/Genuine Parts Co. and Gates Corp./XL Parts. Short videos submitted by all the AASA Channel Excellence finalists were played at the AASA Vision Conference and will be posted on the AASA website. More information is available at the AASA Channel Excellence Award webpage or by contacting AASA Senior Vice President Chris Gardner at [email protected].